After a long and wonderful life of 93 years, Virginia (Ginger) Tornbom, beloved mother, Tutu, loyal friend, and educator, passed away peacefully at home at Hawai'i Kai Retirement Community on November 1, 2017. Ginger was born Virginia Hessick in Florence, Colorado, and grew up in Huntington Park, California. She attended University of Southern California from 1942-1944, and completed her education at Long Beach State in 1958. After living in Laguna Beach, California for 24 years, Ginger and her then husband George Reay moved to Hawai'i in 1969. She taught 2nd & 3rd grade at Punahou School for 18 years, loving the school, and fondly remembered each of her students throughout her life. She married Stan Tornbom in 1974. They spent their summers in Bend, Oregon and traveled extensively. In Ginger's 48 years in Honolulu, she was a member of the Unity Church, P.E.O. Chapter B, the Caledonian Society, and the Outrigger Canoe Club. 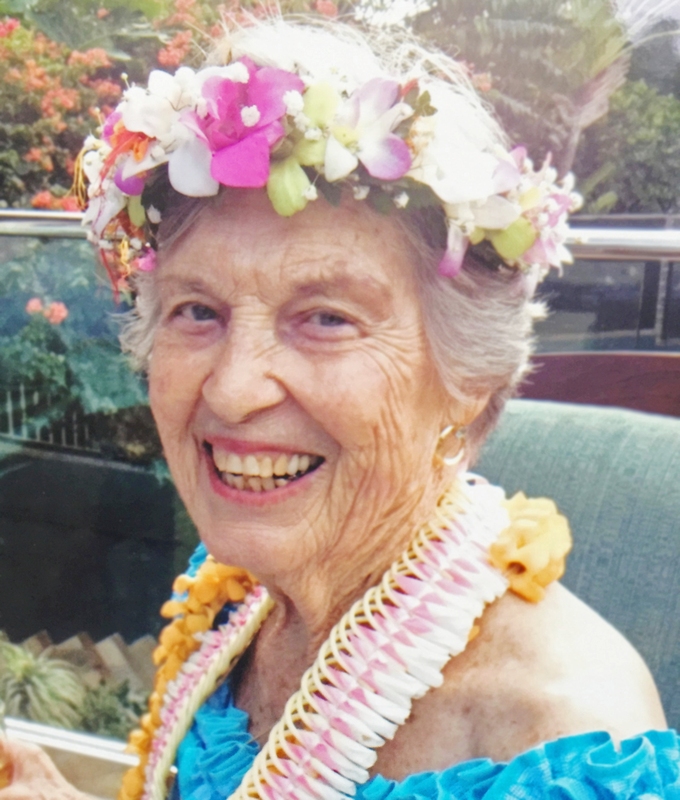 For the past 14 years she resided at Hawai'i Kai Retirement Community. She remained vital mentally and physically, including contributing to the HKRC news and was on the new resident welcoming committee. She is survived by 3 daughters, Laurinda Hadsell, Cindy Reay, and Gina Hart (Bruce); stepdaughters, Ramey Wolf (Charles) and Laurie Parkinson (Graham). Her greatest gifts and joys in life were her grandchildren, Holly Hadsell El Hajii (Moumen), Geordan Purdy, Brandon Purdy (Pamela Reeves), Kahea Hart (Claudia Cox), and Makena Hart (Rachel), as well as her 11 great- grandchildren. Her enthusiasm and love of life will be greatly missed by her family and many longtime friends. In lieu of flowers, the family suggests donations in Ginger's memory to P.E.O. Project for Continuing Education and Punahou School. Celebration of life at Thurston Memorial Chapel, Punahou School on Saturday, December 2, 2017. Visitation 2:30 p.m. Service 3:00 p.m.